How soon can you get rid of that Edgy-Wedgie? Yesterday, I had a really fun one hour lesson with 5 year old Jake and his father, Matt. Matt is a strong skier and had already taken Jake skiing several times. In fact, the two of them had done six runs down the Big Easy before meeting with me. Jake was skiing with the aid of an Edgy Wedgie, which helps children keep their skis in a wedge. Matt's initial goal for the lesson was for Jake to learn how to turn, and my idea of us losing the edgy-wedgie was a bit of a surprise. As you'll see in the video below, Jake lost his Edgy-Wedgie and learned to turn in one fell swoop. Which brings us to the Q & A for today's post. Q - How many runs should you do with the edgy-wedgie on? A - As few as possible! Depending on your child's age and muscle development, I'd say 3 to 8 short runs. 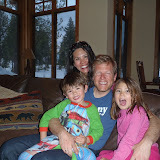 Q- How do you know when your child is ready to ski without it? A - When you can see that the tubing is not stretching (or not stretching much) between their skis. This shows that they're holding the wedge themselves. Q - How do you encourage your child to be free of it? A - When you first introduce the device, make it fun and even funny. I say "Hey, I've got this friend, Sammy the snake, and he's here to help you make your pizza with your skis. See how he stretches when you make a big pizza? OWWW! Careful not to stretch him too hard.... he's a delicate snake!" Over the course of 3 to 6 runs, I encourage the child to try to ease Sammy's pain by holding their toes together. As soon as I see that Sammy isn't doing any of the work, off he comes, never to be seen again. Spring conditions have arrived in force! After all the snow she's been giving us, Mother Nature has suddenly turned up the heat. The kids were skiing in T-shirts yesterday, and the snow was soft, soft, soft. 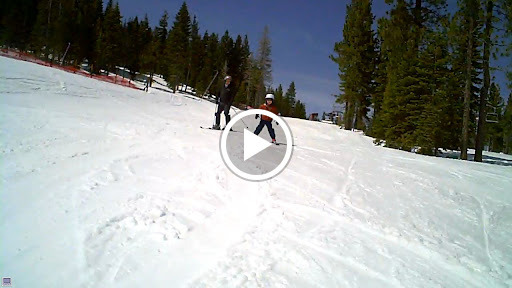 Since Northstar has extended the season to April 24th, come up and get some spring skiing! Down below are links to the photo gallery for the slide show above. All the pictures and videos are from lessons taken in late March and April.